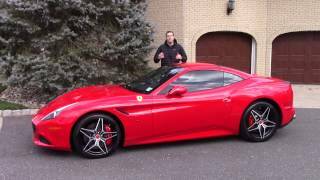 Italian Auto maker Ferrari has announced that they will be officially showcasing the 2013 Ferrari California at the Geneva Auto Show which will be held in Switzerland next month. The latest model is faster and lighter than any of its predecessors, features a retractable hard top and can accommodate more than persons in its cabin. The elegant yet sporty look of the 2013 California is sure to attract many customers when it hits the markets. The 2013 Ferrari California has been equipped with an improved body framework that has been designed and developed by the Scaglietti Centre of Excellence. The car frame has been manufactured using advance aluminium construction and fabrication procedures which have greatly reduced the weight of the car by around 30 kilograms without compromising on aerodynamic performance and stability of the car. The customers also have the option to install the Handling Special tuning package that makes the driving experience even more enjoyable by improving the control over the car. The tuning package involves an enhanced suspension system that improves stability and reduces body roll. The car will also receive the stiffer springs and Magnetorehological damper upgrades which are also supposed to provide a comfortable driving experience. 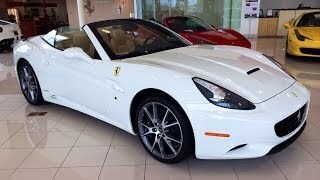 Under the hood, the Ferrari California has been equipped with GDI V-8 engine unit that generates a power output of 490 Horsepower and a torque of 505 N-m for the wheels. The engine has been modified with latest technologies to give the best performance on the road. The California 2013 takes only 3.8 seconds to go from 0 to 62 miles per hour. Ferrari has also provided the latest California model with an improved steering system that is responsible for 10 percent quicker steering ratio and allows for high speed turning.Ferrari is also offering its much acclaimed seven-year standard maintenance program free with the California 2013 which is an added bonus for potential buyers. Maranello, 15 February 2012 – The Geneva Motor Show will see the official debut of the new version of the Ferrari California, production of which has already commenced, with a reduction of weight of 30 kg and an increase in power output of 30 CV.